Regular camp hours are 9AM – 4PM with drop off and pick up between 8:30AM and 4:30PM. Extended Care is available for drop off and pick up between 8:00AM – 5:00PM. 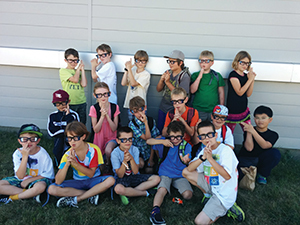 Our week-long art, science and technology camps are full of fun every July and August! Campers will enjoy a variety of hands-on experiments, demonstrations and recreational activities such as swimming. When the weather is nice we will visit the Spray Park and Nicholas Sheran Playground for games and water activities. Campers go on adventures all over campus and often get to participate in faculty led activities in University labs. Our priority is to make science FUN while we encourage learning, exploration and creativity! For details on all the camps we offer, please view the Camp Brochure linked above. Summer is the perfect time to put previous learning to use in creative ways and to learn new information and skills with friends in a fun, supportive atmosphere! Register today! Cost: Cost varies by camp length - please refer to the camp schedule. Camp fees include a camp t-shirt or a USB wristband! Cancellation Policy: A $20 cancellation/$10 transfer fee is charged for each activity/program cancellation or transfer. The administration fee is not applicable on refunds due to enrolment quotas. All cancellations/transfers must be received in writing, by Sport & Recreation Services before consideration. Canceling within 7 working days and 1 working day prior to the commencement of the activity/program will result in a 50% refund of original registration fee – materials portion of registration will not be refunded. Refunds/transfers will not be considered from 1 day prior to the commencement of the activity/program. Refund requests received after the start of the activity/program will be considered on an individual basis. These requests need to go to the appropriate program supervisor for approval.